Bring fresh thinking to your product or service built on a solid foundation of consumer insights. Use Discovery Driven Innovation to bring fresh thinking to your product or service built on a solid foundation of consumer insights. We help you discover and decode insights, generate new ideas, develop and test solution concepts. These projects help clients make big leaps based on a deep understanding of customers and context, by bringing qualitative insights and expert facilitation together. Our Clear Insights Process™ guides our collaborative efforts, and ensures we never lose sight of your objectives. More important, ongoing debriefs throughout the project mean you can implement quick wins as you find them. Qualitative methods such as Discovery Labs, online communities and on-site observation generate insights. This is the power that discovery driven methods bring to your innovation challenge – you build new ideas based on a solid foundation. Decoding matches the project. It might be extracting need states or occasions of use. It might be looking at roles and relationships. It might be capturing goals in the context of a segment. We supplement your team’s perspective with our own team’s expert analysis. Finding the right question is the first step towards getting a new answer. We use a variety of brainstorming techniques to uncover the questions that come out of the discoveries. Divergent thinking is a powerful tool to help your team generate new answers. Our approaches include brain-writing, brainstorming, forced connections, laddering and dozens of divergent techniques. Ideas need to be evaluated and turned into concepts. Concepts need to be tested and refined with input from your target group. Road maps need to be created. Does your brainstorming need a kick-start? Learn the methods professionals use to get more and better ideas when brainstorming. 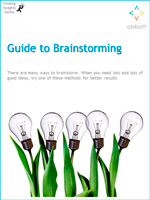 Download our free guide to power up your brainstorming sessions! How can we bring customer insight into a major bank's IT development process? Our client was planning a major platform overhaul to the main business banking platform used by their largest and smallest business clients. The need – bring customer insight into the IT development process.